The Camp Fire Samish calendar is full of activities and events. Here is a list of coming events. Day Camp and Resident Camp Registration is Open! Youth and parents are invited to participate in activities such as; tie-dying shirts, board games, scavenger hunts, sack races, creating friendship bracelets, and so much more. Spring Camporee is April 26th to the 28th. For those spending the night on Friday, dinner is not provided. Please contact Sasha for any further questions. Sasha@campfiresamish.org. Click Here to register. 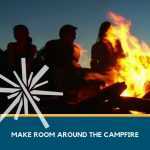 Gather your friends for Camp Fire Samish’s 13th Annual Dinner & Auction on Saturday, May 4th at the Swinomish Casino & Lodge. Silent Auction and complimentary wine begin at 5:00 pm. Many items will be up for bid during the live and silent auctions. Email auction@campfiresamish.org for more information. Get your tickets here!